^ “French Caribbean voters reject change”. Caribbean Net News. (2003年12月9日). オリジナルの2009年3月18日時点によるアーカイブ。. https://web.archive.org/web/20090318194043/http://www.caribbeannetnews.com/2003/12/09/voters.htm 2007年2月9日閲覧. 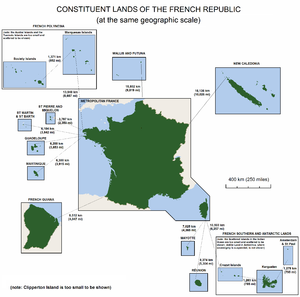 "However voters on the two tiny French dependencies of Saint-Barthélemy and Saint-Martin, which have been administratively attached to Guadeloupe, approved the referendum and are set to acquire the new status of "overseas collectivity"." ^ Magras, Bruno (2007年2月16日). “Letter of Information from the Mayor to the residents and non-residents, to the French and to the foreigners, of Saint Barthelemy” (PDF). St. Barth Weekly. p. 2. http://www.st-barths.com/jsb/pdf_files/weekly108.pdf 2007年2月18日閲覧. "On February 7 of this year, the French Parliament adopted the law granting Saint-Barthélemy the Statute of an Overseas Collectivity."